This event comes up in June 2013. The competition is only open to Poets that have never performed at WORD UP and that will be in Nigeria at the time of the competition. and they automatically get to perform at the next edition of WORD UP on August 17, 2013. 1. Official Hashtag of the competition is #WarOfWords1. 2. 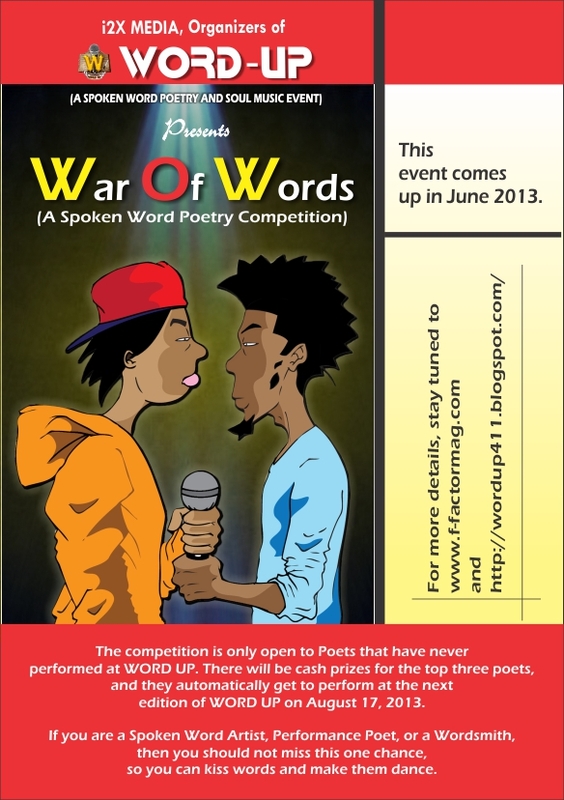 The title of the poem must contain the official hashtag #WarOfWords1, else your entry is not valid. 3. You will be required to submit an original poem that is in English, pidgin English or a combination of both. All non-english words used in the poem must be explained in the information box of the video. 4. Ensure your name/ stage name, email address and wordings of the video are in the information box of the video. If the information box can not contain the wordings of the poem, send it to wordup4one1@gmail.com stating your name and title of the poem with the hashtag in the subject box of the mail. 5. The video submissions should not be more than 3 minutes long and must be uploaded on your Youtube channel. If you don't have a Youtube channel, please open one. 6.The submitted video must be one camera, one poet and recorded specifically for the competition. No live performance videos and no special effects. 7. All poets are limited to a total of one submission. 8. You will be required to post the link of the Youtube Video in the comment section of this post and other subsequent related post(s) on www.f-factormag.com and http://wordup411.blogspot.com, else your entry is not valid. 9. You will also be required to tweet the video link with the official hashtag #WarOfWords1 at any or all of the twitter accounts in the body of this post and on our Facebook official page after liking the page, else your entry is not valid. 10. The theme of the competition will be supplied when the competition officially opens :). Wow, I love this, and I am rearing to go.